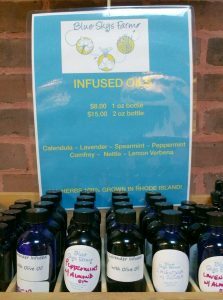 We now offer our very own INFUSED OILS! An infused oil, also referred to as a macerated oil, consists of a carrier oil that has been permeated with one or more herbs. The benefit to using an infused oil, as opposed to a plain carrier oil, is that the infused oil will contain the properties of both the carrier oil and the herbs that were infused into the oil. The infused oils that we offer are lavender, calendula, peppermint, spearmint, comfrey, nettle and lemon verbena. The carrier oils we use are almond, jojoba and olive. There are many uses for infused oils: such as a massage oil, moisturizing lotion or you can add to salves, lip balms, facial serums, hair treatments and soaps. We grow many culinary and medicinal herbs. Our selection varies seasonally. 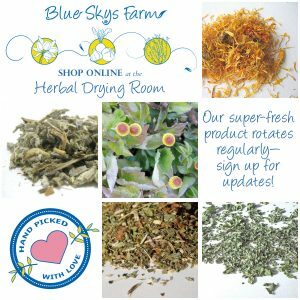 Here’s some information about some of our herbs. ASHWAGANDHA ROOT: The “ginseng” of Ayurvedic medicine, the traditional medicine of India and is considered an “adaptogen,” a term used to describe herbs that improve physical energy and athletic ability, increase immunity to colds and infections and increase sexual capacity and fertility. CALENDULA: antiviral and anti-inflammatory—good for dermatitis and acne. CATNIP: a nervine; it helps with sleep, relaxation, and stress reduction. HOLY BASIL/TULSI: considered an “adaptogen” that regulates circulatory system and lowers cortisol production from stress; it is rich in antioxidants, which help the body fight free radicals that are responsible for causing various chronic degenerative diseases. LAVENDER: soothes insect bites, burns, headaches, aids in sleep and relaxation. LEMON BALM: a nervine, a nervous system tonic, a mood elevator, and good for the liver; antibacterial; calming, reduces anxiety, helps sleep. LEMON VERBENA: Good for digestive disorders including indigestion, gas, colic, diarrhea, and constipation; good for agitation, joint pain, trouble sleeping (insomnia), asthma, colds, fever, hemorrhoids, varicose veins, skin conditions, and chills. NETTLE: a tonic for the urinary tract, kidney, gastrointestinal tract, skin, and vascular system; nutritive. PEPPERMINT: treats upset stomach, IBS, and bloating; enhances memory and alertness. SAGE: a tonic for the respiratory tract, gastro-intestinal tract; antibiotic, anti-inflammatory, anti-fungal; helps throat infections, dental abscesses, infected gums, and mouth ulcers; the phenolic acids in sage are particularly potent against Staphylococcus aureus. SPEARMINT: helps to relieve headaches, nervous strain, fatigue, stress, and respiratory problems (asthma, bronchitis, and catarrh).